The good news is that plantar fasciitis is reversible and very successfully treated. About 90 percent of people with plantar fasciitis improve significantly within two months of initial treatment. If your plantar fasciitis continues after a few months of conservative treatment, your doctor may inject your heel with steroidal anti-inflammatory medications (corticosteroid). Cortisone injections have been shown to have short-term benefits but they actually retard your progress in the medium to long-term, which usually means that you will suffer recurrent bouts for longer. Due to poor foot biomechanics being the primary cause of your plantar fasciitis it is vital to thoroughly assess and correct your foot and leg biomechanics to prevent future plantar fasciitis episodes or the development of a heel spur. Your physiotherapist is an expert in foot assessment and its dynamic biomechanical correction. They may recommend that you seek the advice of a podiatrist, who is an expert in the prescription on passive foot devices such as orthotics. There are several things you can do to self-treat your heel or arch pain. 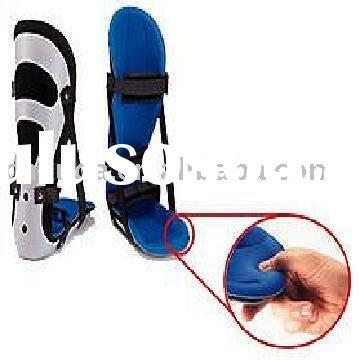 The first thing is to wear better shoes and consider adding arch supports or custom foot orthotics to your shoes. Stretching the calf muscles can also often be helpful. Try to stretch when you first get up in the morning and before you go to bed at night. Another good exercise is to “roll” your arch and heel. This is done by placing a tennis ball, golf ball, or lacrosse ball on the floor and rolling your foot on top of it. Some people get extra benefit by “rolling” on a frozen water bottle. You should also carefully evaluate your fitness program as you may be overdoing it. You may want consider backing of new or recently added exercises or increases in training until your heel pain improves. If you work at a standing job try to take more time to walk around during the day and avoid standing in one place for too long. The Plantar Fascia is a broad, thick band of tissue that runs from under the heel to the front of the foot. Through overuse the fascia can become inflamed and painful at its attachment to the heel bone or calcaneus. The condition is traditionally thought to be inflammation, however this is now believed to be incorrect due to the absence of inflammatory cells within the fascia. The cause of pain is thought to be degeneration of the collagen fibres close to the attachment to the heel bone. Plantar fasciitis is the inflammation of the plantar fascia – a band of tough fibrous tissue running along the sole of the foot. It occurs when small tears develop in the plantar fascia, leading to inflammation and heel pain. The plantar fascia tissue branches out from the heel like a fan, connecting the heel bone to the base of the toes. When the foot moves, the plantar fascia stretches and contracts. The plantar fascia helps to maintain the arch of the foot in much the same way that the string of a bow maintains the bow’s arch. The most notable symptom of plantar fasciitis is heel pain. This is typically most severe in the middle of the heel though it may radiate along the sole of the foot. The pain is most often felt when walking first thing in the morning or after a period of rest. As walking continues the pain may decrease; however some degree of pain remains present on movement. 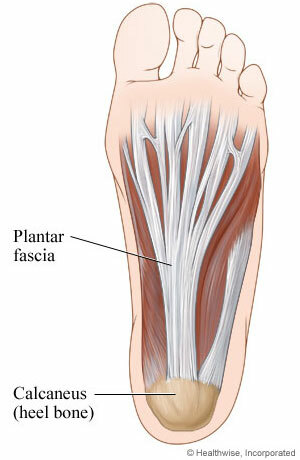 The pain may disappear when resting, as the plantar fascia is relaxed. Redness, swelling and warmth over the affected area may also be noticed. The onset of plantar fasciitis is gradual and only mild pain may be experienced initially. However, as the condition progresses the pain experienced tends to become more severe. Chronic plantar fasciitis may cause a person to change their walking or running action, leading to symptoms of discomfort in the knee, hip and back.